No-Assembly required: The shelves doesn't require any assembly. After unfolding the main iron frame, clip the 4 shelves in their respective places and start using. Multiple Usage: Ideal for the living room, the bed room, kids room, the kitchen. Suitable for both indoor and outdoor applications, at home or in the Office. Can be used for your plants as its design allows an easy maintenance of your plants and the back bars will function as a support while they grow. 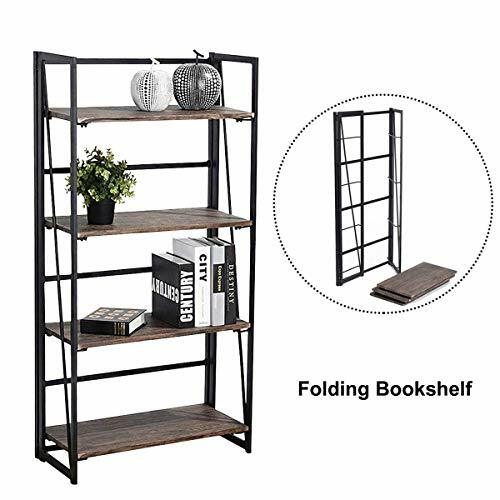 Foldable: The Coavas rustic industrial Bookcase shelves is foldable which allows you to store it under the bed or in your closet while not using. This Bookcase is SOLD by Vogue Carpenter.If you have any questions about this shelf,please contact us by email-housecarpenters@outlook.com,I will reply in time . Industrial Bookshelf - LARGE SHELF SPACES - Dimensions 23.6x11.6x49.2 Inch. The space between the shelves is 13Inch allowing a large storage area for your multiple items, books, family photos, frames, devices, utensils or plants. Include 4-Tier shelves and an additional ground storage space under the 1-Tier shelf. Industrial Bookshelf - STURDY IRON FRAME - Sturdy black coated iron frame with two oblique side bars and extra back bars for a better stability and resistance. Industrial Bookshelf - READY-TO-USE/NO ASSEMBLY - Unbox then clip the shelves into the iron frame and start using as you please. Allows you to easily move the shelve organizer and to store it under the bed or in the closet when not needed. Industrial Bookshelf - EASY TO CLEAN - Made of durable MDF material resistant to water and wear for easy maintenance and durability. Industrial Bookshelf - MULTIPLE USAGE - Ideal for the living room, the bed room, kids room, the kitchen, as outside storage for gardening tools or plants, can be also used in the office for storage and display.